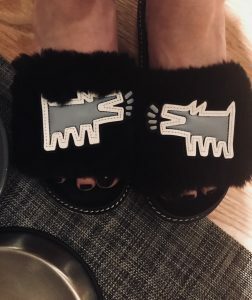 March | 2018 | Footwear Fashionista … a sneak peek into my shoe closet! Coach X Keith Haring Slide – a fluffy, shearling slide adorned with American graffiti-pop artist Keith Haring’s appliqué of a barking dog. For when your dogs are barking … or when you just want to relax and look artsy. Eclectic, a 60s-inspired faux-leather ankle bootie from Crosswalk. The 3″ tapered heel is wrapped in faux-pressed reptile leather. The burgundy color is subtle, yet striking against the contrasting black. The vertical lines help elongate the leg and add a bit of sass to your step. 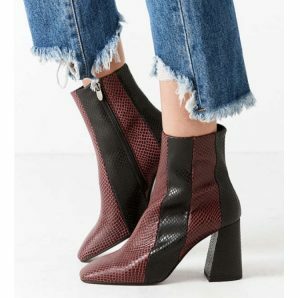 These boots work for spring and fall and look great with ripped jeans.